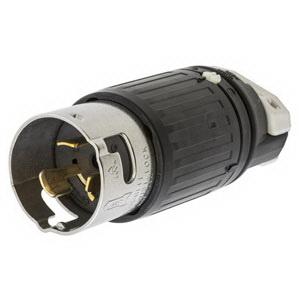 Hubbell-Wiring Twist-Lock® Polarized locking plug has super tough nylon housing that offers better impact qualities. It comes with stainless steel shroud, which protects contacts and prevents mismating. The heavy duty 2-piece external cord clamp provides maximum strain relief. This locking plug has thermoplastic polyester interior to provide heat resistance and impact strength. Locking plug meets UL 94/498 and CSA C22.2 standards.